Ha-nuka is from Israeli tangler Yamit Fridman and its name was inspired by Hanukkah, the Jewish holiday which begins at sunset tomorrow (Tuesday, December 16). Ha-nuka is Yamit’s second tangle pattern on the site; her first was Z-trik, and she also has contributed several strings to our community resource. As you may know, “Hanukkah (… a transliteration also romanized as Chanukah or Chanukkah), also known as the Festival of Lights, Feast of Dedication, is an eight-day Jewish holiday commemorating the rededication of the Holy Temple (the Second Temple) in Jerusalem at the time of the Maccabean Revolt against the Seleucid Empire of the 2nd century BC. Hanukkah is observed for eight nights and days, starting on the 25th day of Kislev according to the Hebrew calendar, which may occur at any time from late November to late December in the Gregorian calendar.” – Wikipedia. For more about Hanukkah and all the festivities and traditions surrounding it, see this page at chabad.org. Yamit illustrates the step-by-step instructions for drawing Ha-nuka below and features it in a monotangle with a range of pretty variations. I used the variation in the middle of the bottom row for my example and I love how it has a layered look with the dark color (black) appearing to come forward. Check out the tag yamitf for more of Yamit’s tangles on TanglePatterns.com. A very Happy Hanukkah to all our Jewish friends! 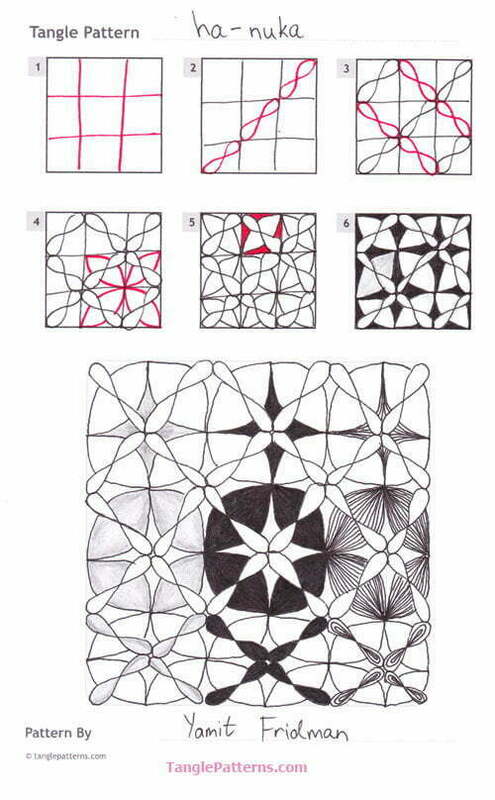 Lovely pattern! I am anxious to try it! Thank you for sharing. Greetings from Houston. Sorry we didn’t get to meet face to face in Israel this past Spring. I love this tangle, the name is perfect and I couldn’t help but see a star such as the one that shined over Bethlehem. There is rich symbolism in this tangle. 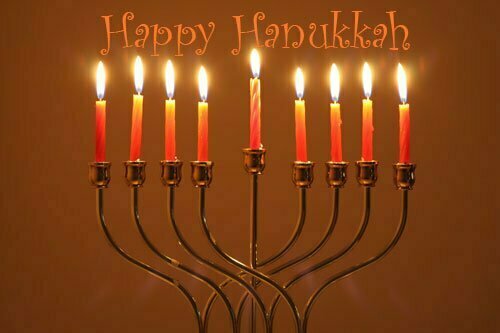 Happy Hanukkah to you and your precious family. Thank you for your loving words. Although I love all the Christmasy tangles and have been enjoying looking at the wonderful creations, I do not celebrate Christmas. I celebrate chanukah, and have been looking for an apropos tangle! Thank you so much! Thank you all for your warm comments! And thank you Linda for posting it on your site. We are about to celebrate Hanukkah in israel today. Dear Linda: I just want to tell you how much I appreciate being on your mailing list, although these days life seems too busy to tangle! With my thanks comes the wish that you have a great Christmas. Thank you for all your hard work. Sincerely, Marion P.S. I will be ordering your latest guide in the new year. Thanks so much Marion, I really appreciate your wishes! I’ll be working on the 2015 Guide over the next three weeks and it should be ready around January 10th – I’ll announce when it’s ready.